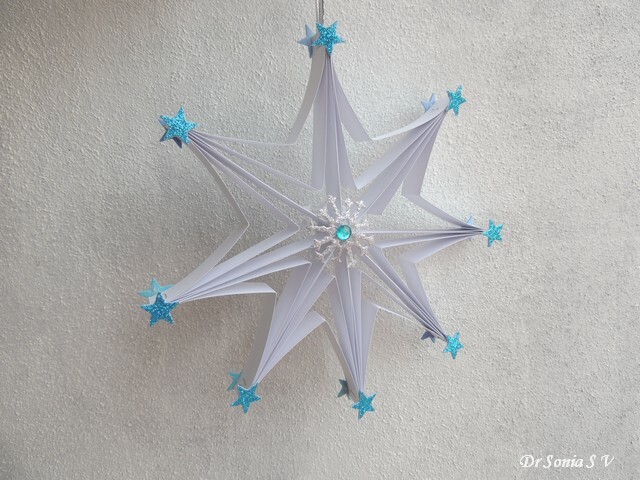 I made these Paper stars initially by following a tutorial by Alix but though it is a super simple project I did run into a few hiccups hence sharing a detailed tutorial with tips. 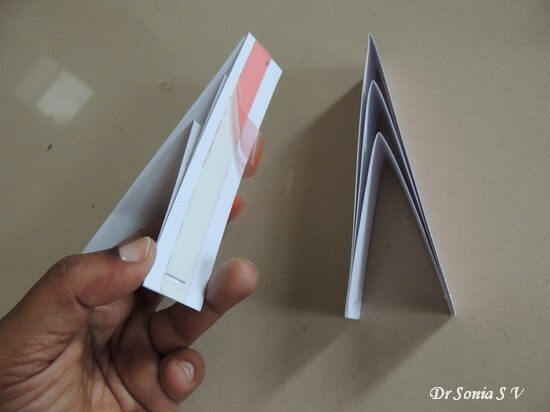 Thick Card Stock- For Indian readers I recommend Ivory Card stock available in Stationary shops otherwise you can use the thickest card stock you get. 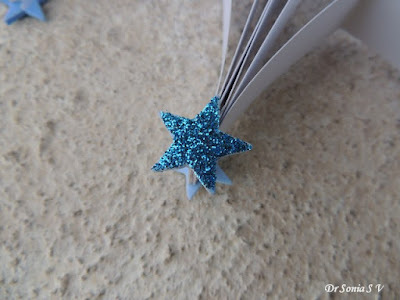 Good quality double sided pattern paper would look especially cool.Avoid thin paper as it will make your stars floppy! 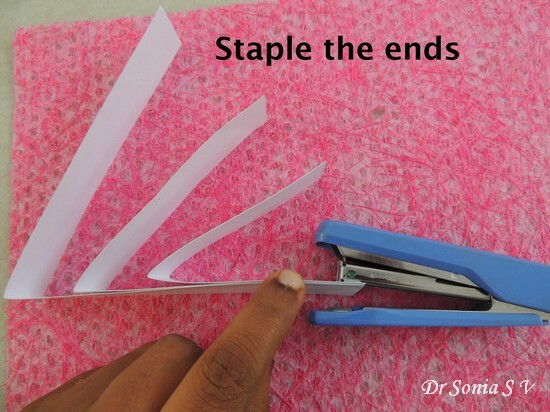 Stapler- drastically cuts down your time! 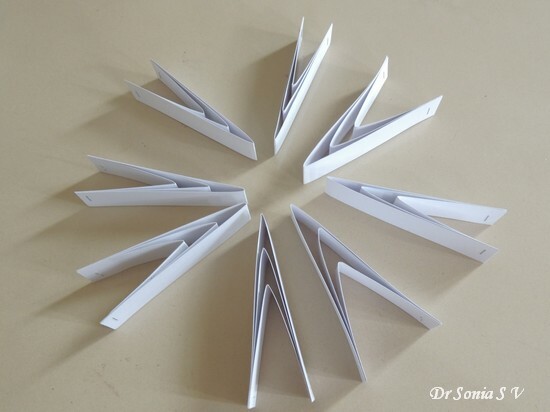 Paper Cutter- If you have a guillotine cutter [read more here : Paper Cutting Tools] making a large number of paper stars is quick and easy! 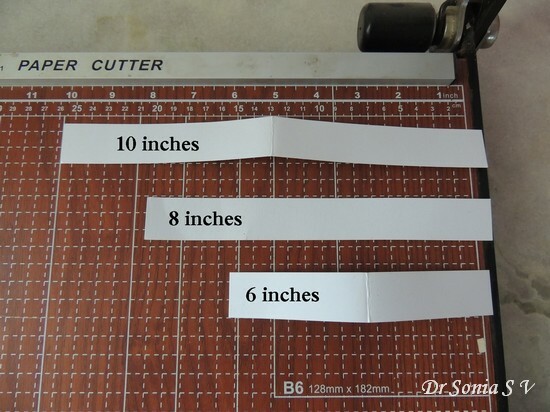 Cut card stock into 10 x 1 inch , 8 x 1 inch and 6 x 1 inch strips. 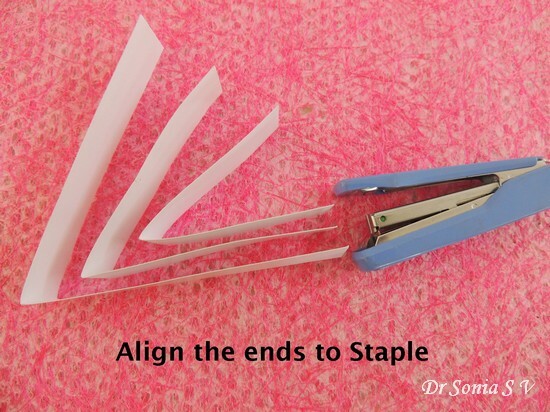 Line up the ends of the paper strips- it is important to line them up perfectly to get a perfect star at the end! 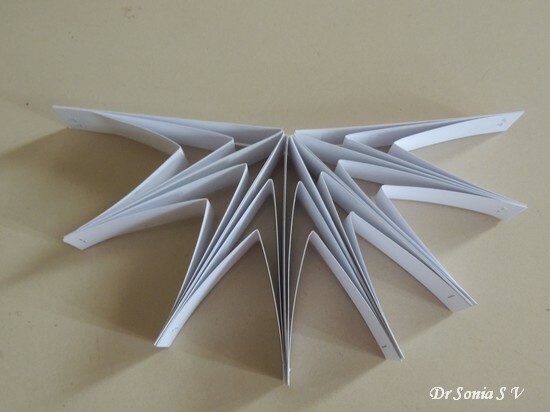 You have made one unit of your folded star. 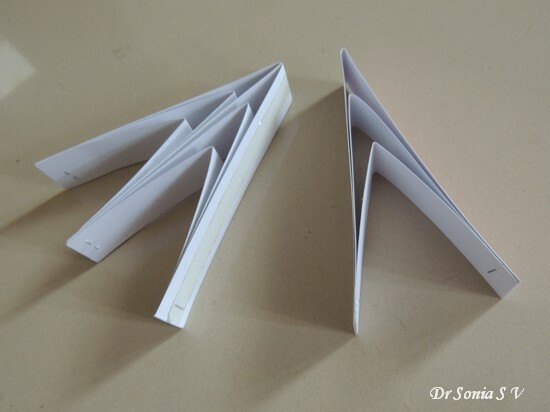 You need to make 7 or more such units. 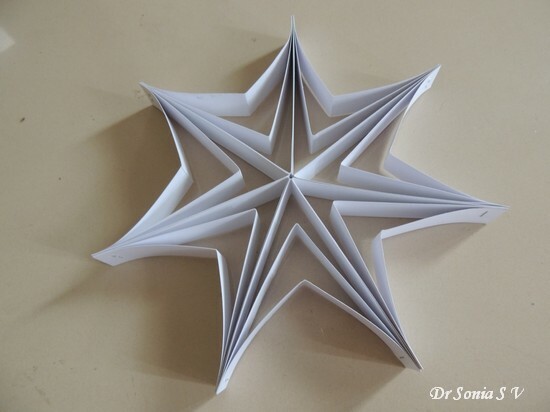 I found that stars made of 7 or 8 units looks the best. 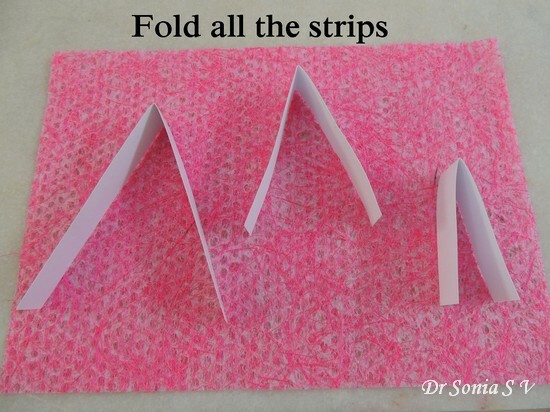 So to make one folded star you need to cut 7 each of 10, 8 and 6 inch wide strips and staple them together. 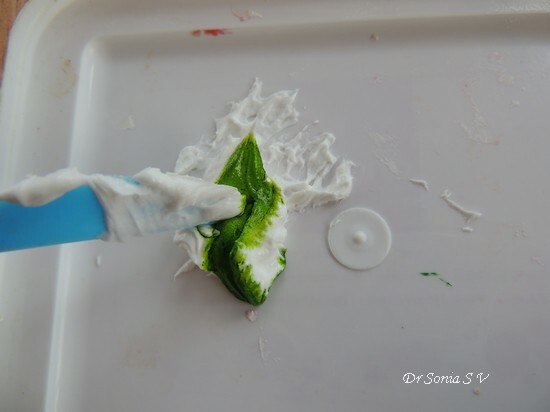 If you are using white glue give enough time for the glue to dry. 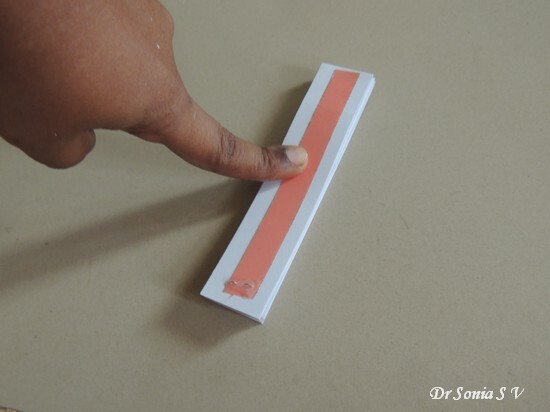 I found tacky tape the easiest and fastest adhesive option in this step. 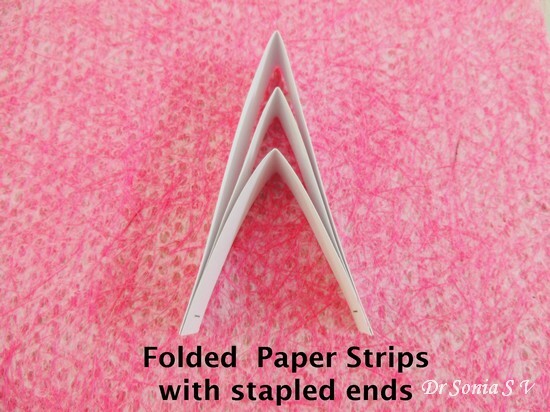 You can also use a stapler but it can be tricky to staple through several layers of thick card stock! 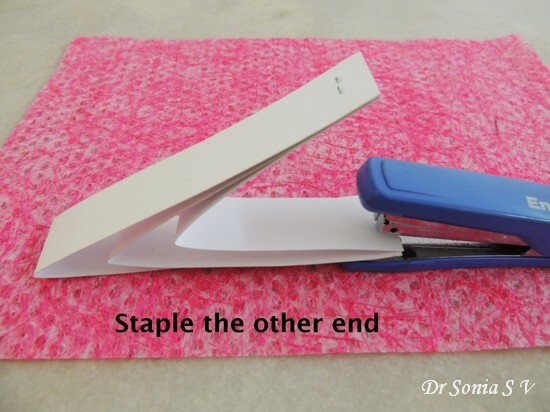 If you wish to add a ribbon you can add it to the adhesive strip before sticking together your 1st and 7th folded unit! 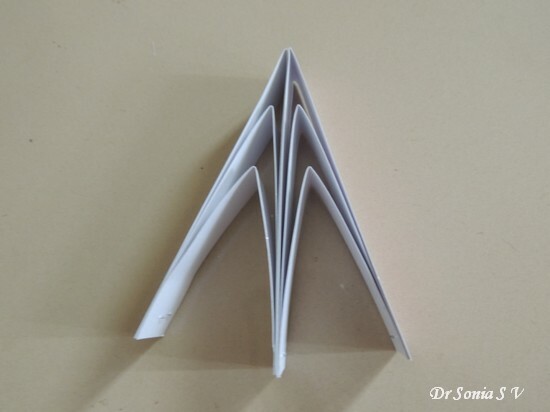 And here is how the folded star looks --super easy to make but a word of warning its not for little hands as my daughter [ she is 9 yrs] declared it was tricky to align the paper strips properly! 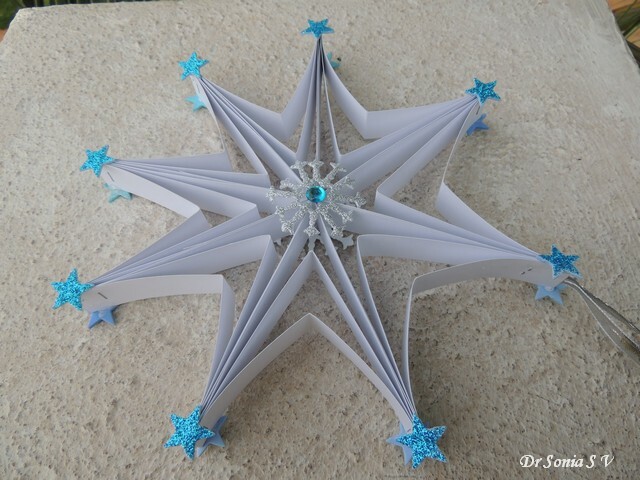 Since these stars are dimensional I added punched out glitter foam stars and die cut snowflakes to both sides of the folded star. 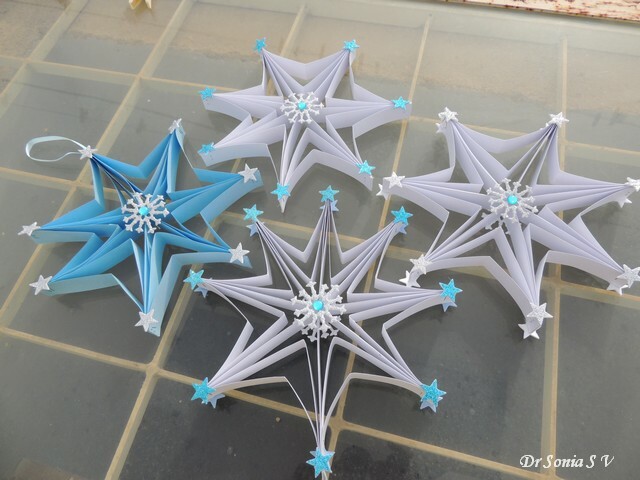 The blue one you see below was made from thinner chart paper and did not turn out as sturdy or as beautiful as the others when hung! 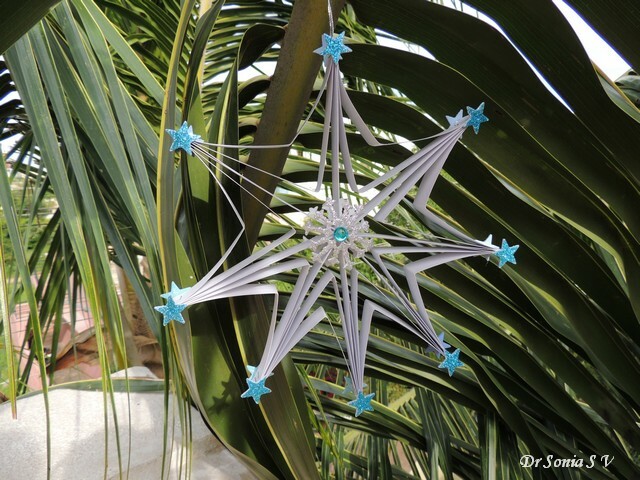 I hope this easy star tutorial will come in handy for making easy party decorations or Christmas decorations. 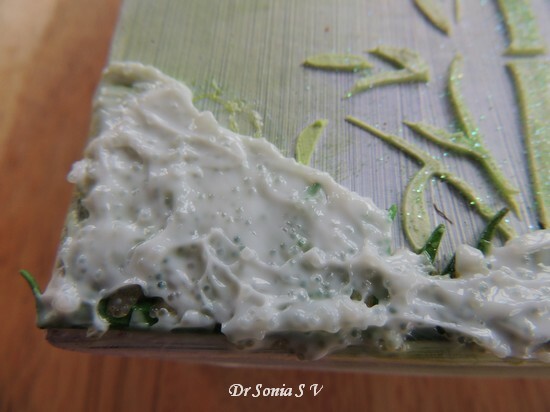 One of the best things about being the DT of Crafters Corner is one gets to experiment with products one has never worked with before. 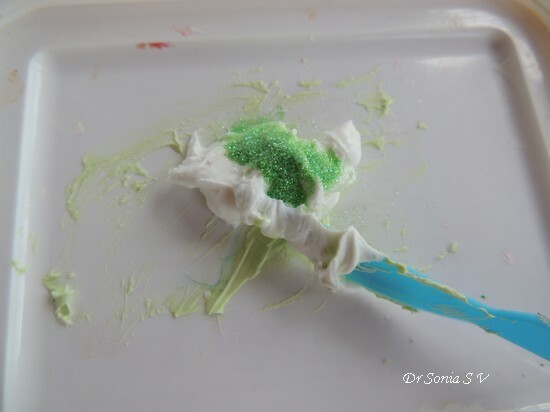 It is scary as well as exciting at the same time if you know what I mean! 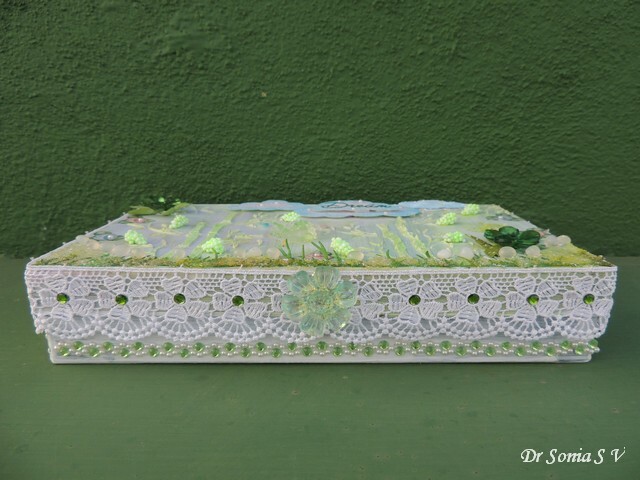 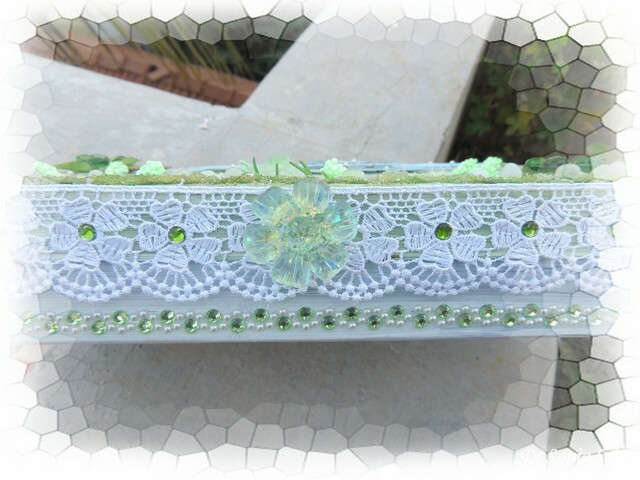 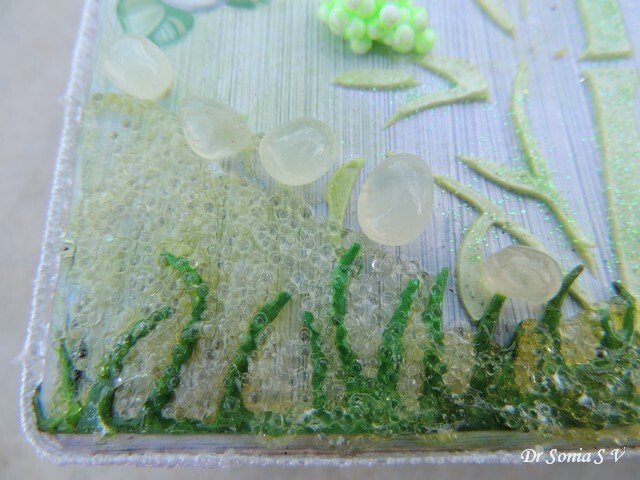 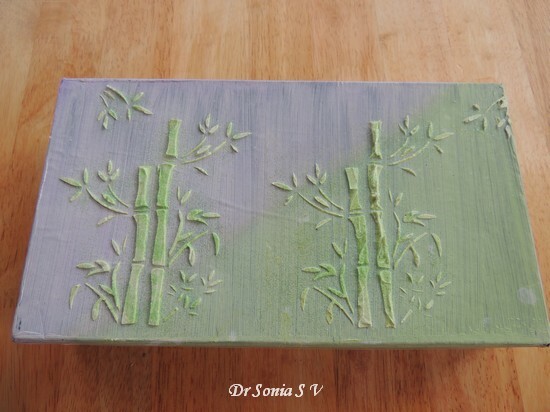 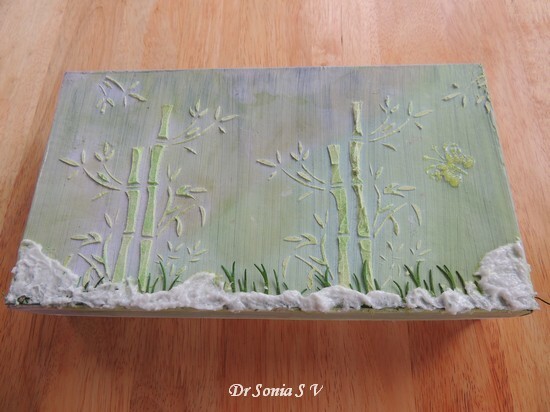 This project featuring experiments with texturing media Whipped Spackle and Glass Beads Gel ! 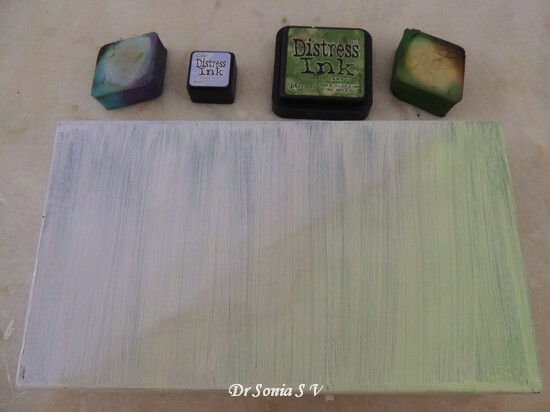 I started off by painting a black box with gesso and sponging with distress inks! 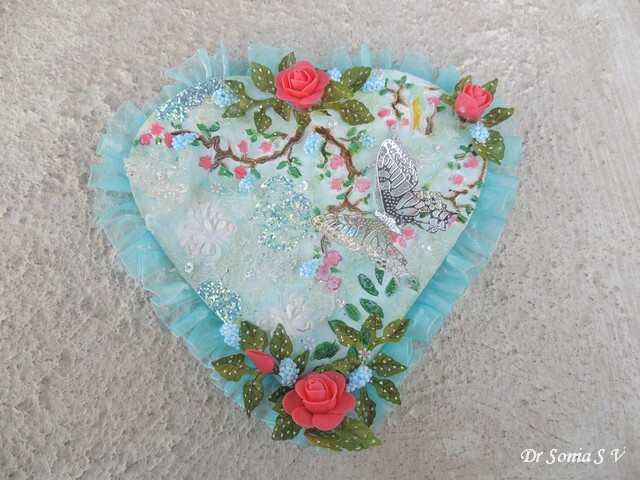 In the Altered Heart Plaque shared earlier I had painted on Whipped Spackle ...that took time so experimented with a quicker way of coloring texture media using alchol inks! 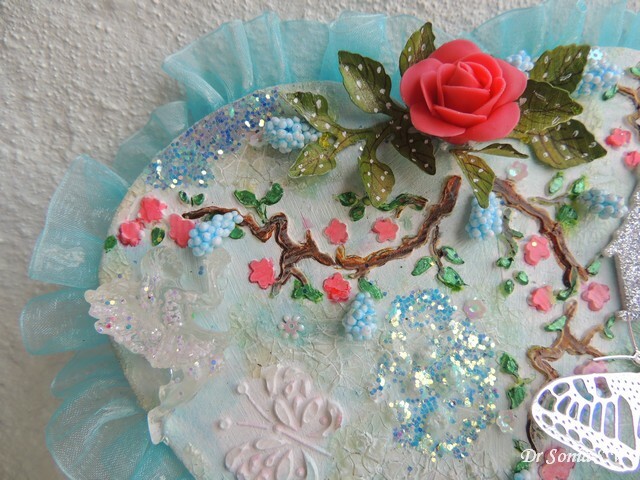 Dusted off the excess glitter by tapping. 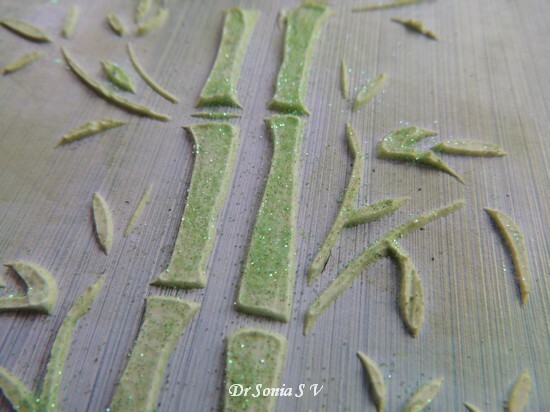 Loved the subtle shimmer it gave! 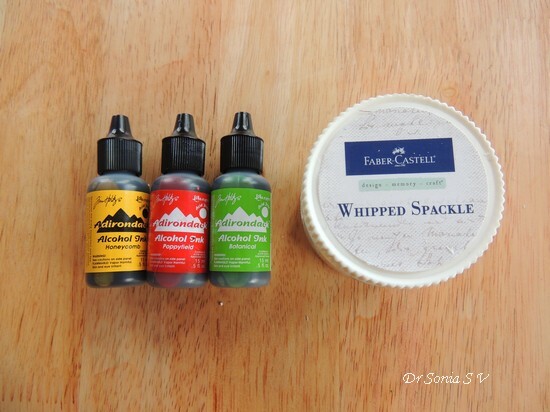 Since Whipped Spackle is very similar to real icing you can get smooth or peaked surfaces by just smoothing or peaking the surface ! 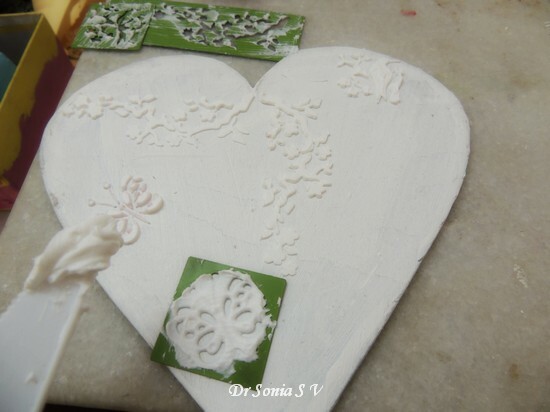 In the top picture I smoothed out the Whipped Spackle using a plastic knife before lifting the stencil while in the picture below I lifted the knife in areas to peak the surface of the Whipped Spackle texturing media! 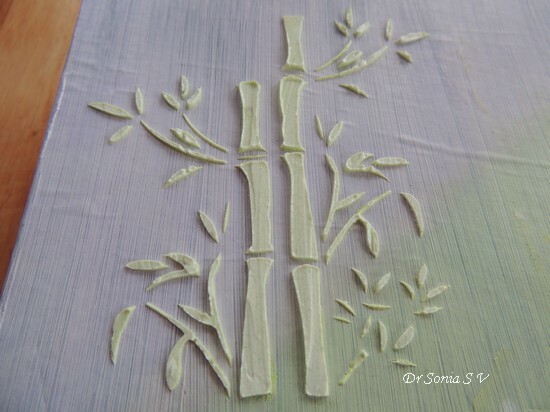 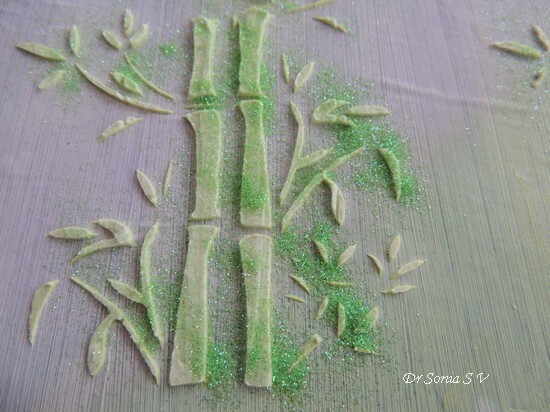 Even though you can apply Glass Beads Gel on a stencil it doesnt work well with tiny or too thinly detailed stencils ! 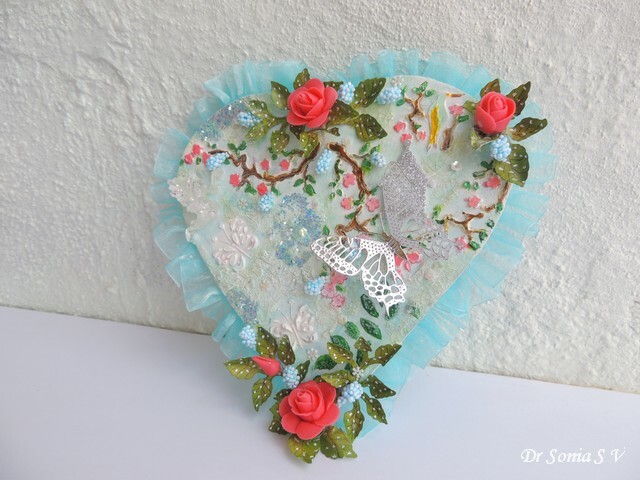 The rather smudgy looking butterfly was made using Glass Beads Gel on the same stencil I used in the Altered Heart which had given such a beautiful effect with Whipped Spackle ! 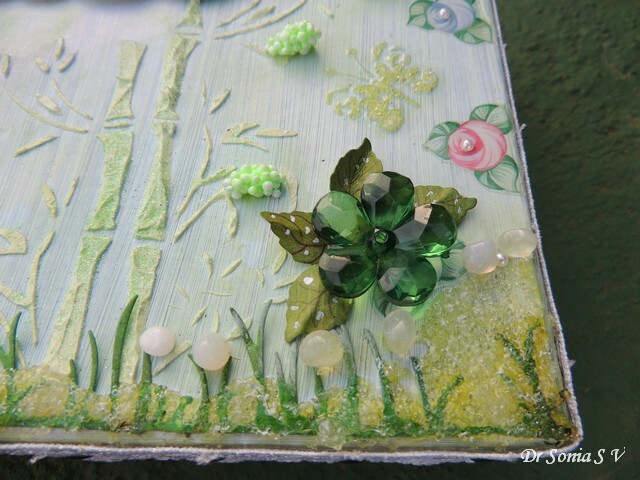 This altered box has a multitude of media: Crystal flowers, Metal leaves, Thermocol [ foam putty] berries, real pebbles, handmade resin flower and fairy.. 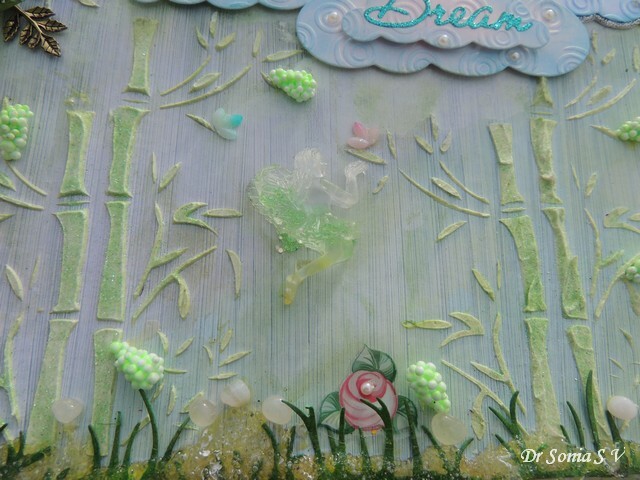 The little fairy was also handmade using resin and a mould. 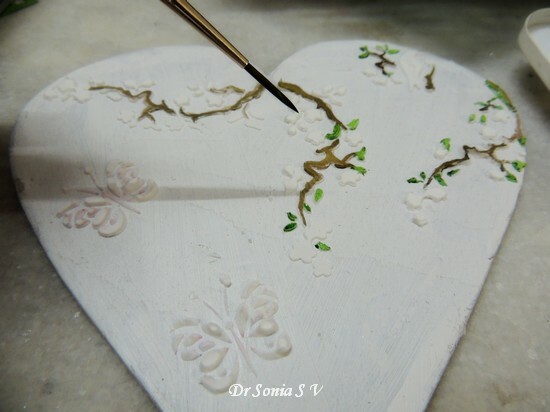 Hi friends do forgive my absence from blogland...I will catch up and visit you all soon! 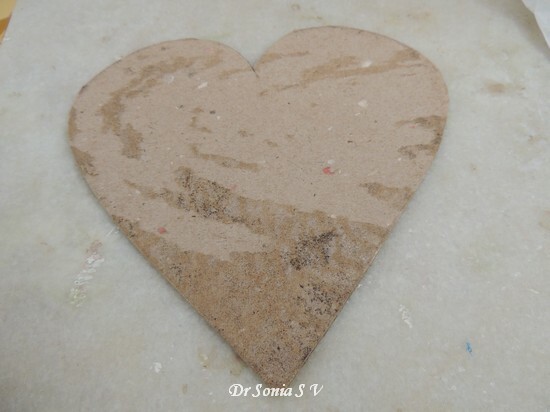 Some objects do have sentimental values attached to them dont they...This heart shaped piece of card board was the base of my mom's 67th birthday cake! 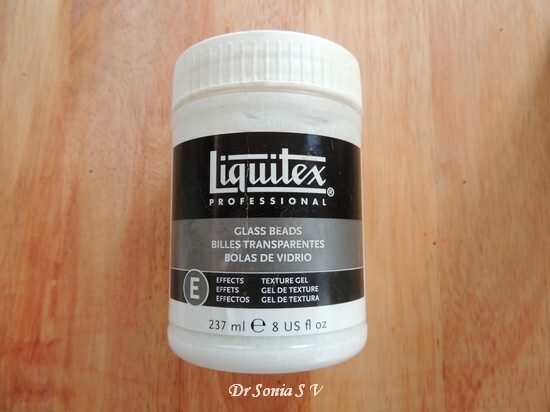 I saved it and gave it the works ! 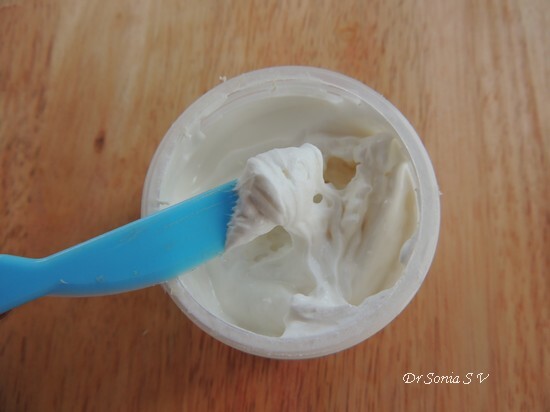 Whipped Spackle is creamy and lightweight like real whipping cream and can be smeared on with your fingers or a plastic knife! 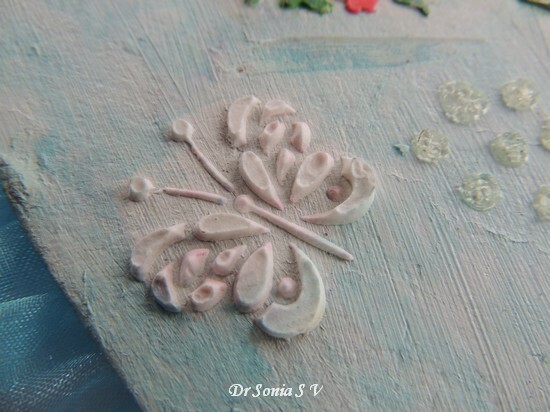 I used a cherry blossom and butterfly metal stencil set that had been lying neglected since ages! 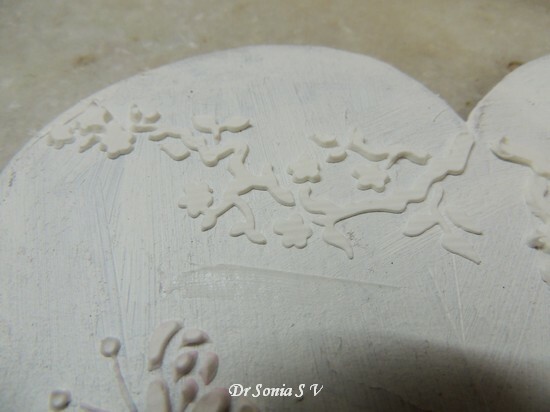 Sponged over the background with tumbled glass distress ink but took care to leave the Butterflies somewhat un -inked ! 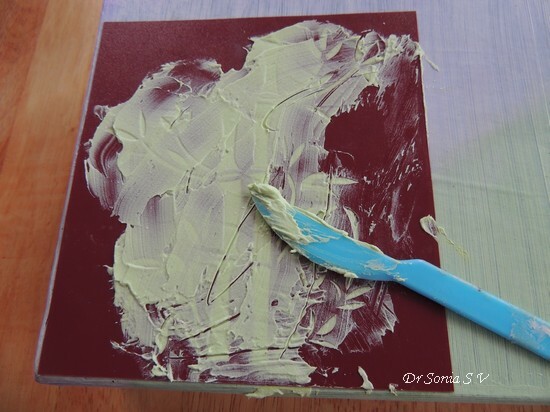 You can actually put several layers of paint on the Whipped Spackle and it will take it all without flattening/ smearing. 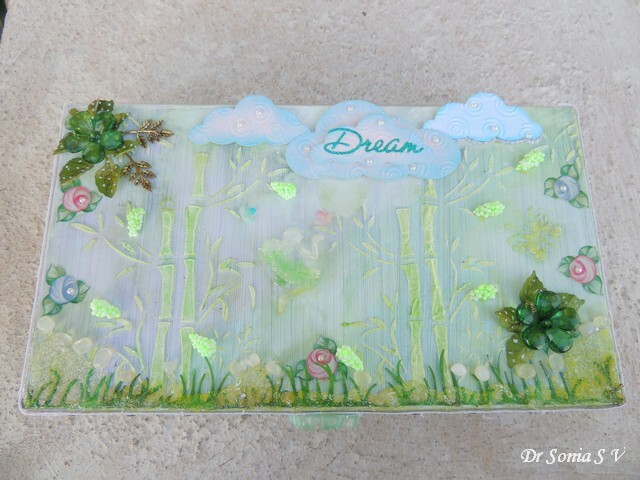 In some areas I wanted a brighter color so used pearl acrylic paints. 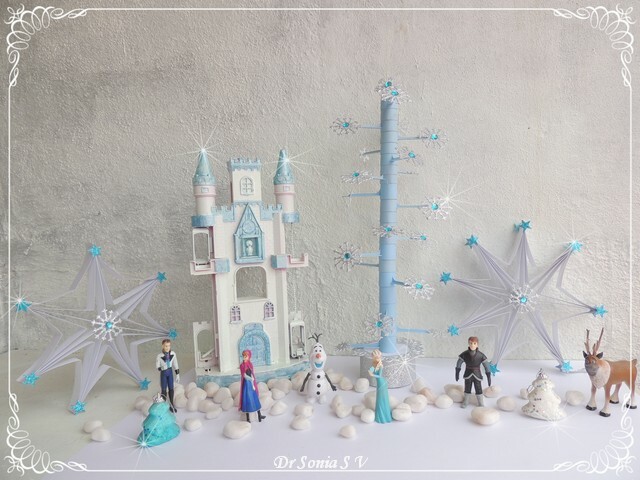 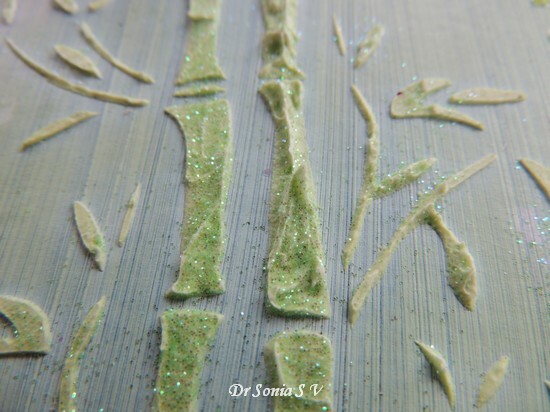 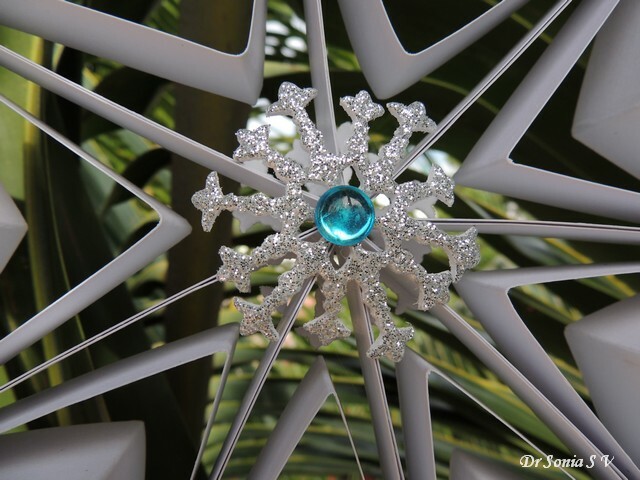 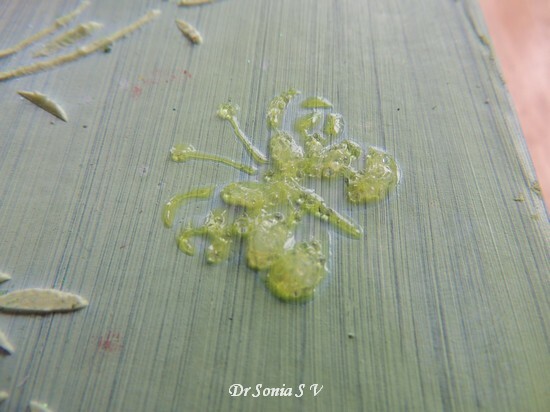 The glittery fairy was made at home using Resin[ Resin is my current obsession!] 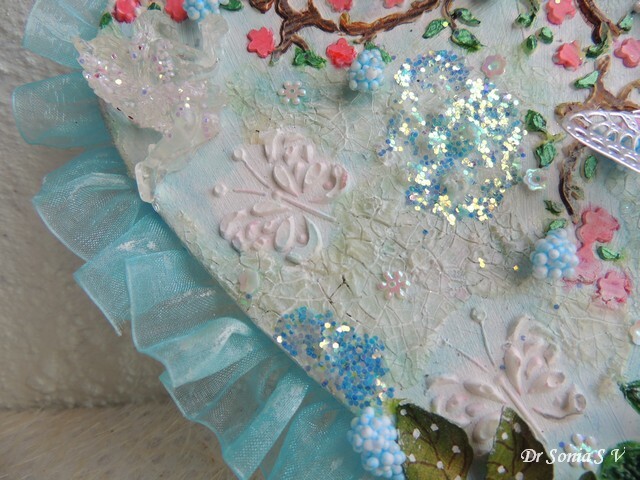 and she is plucking magical blueberries . 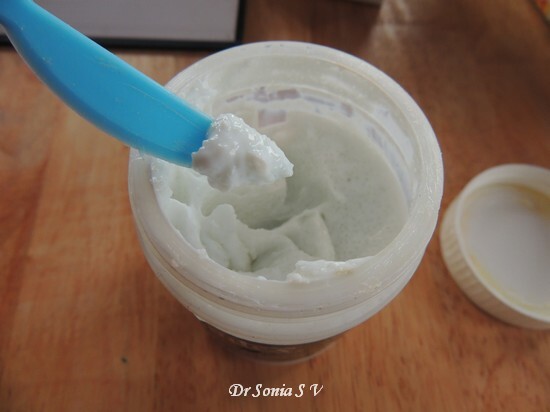 I made the magic blue berries using something called Foam Putty which is soft , sticky and mouldable like clay and has tiny styrofoam/thermocol balls in it! 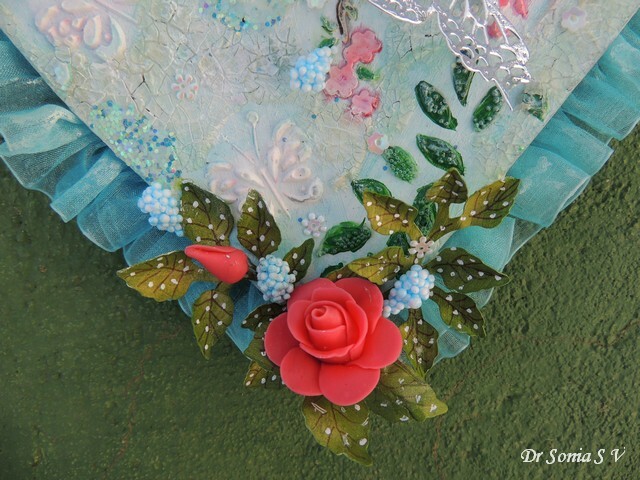 The fun thing about mixed media art is you can really layer on different media and mistakes can be either masked or interpreted as art! 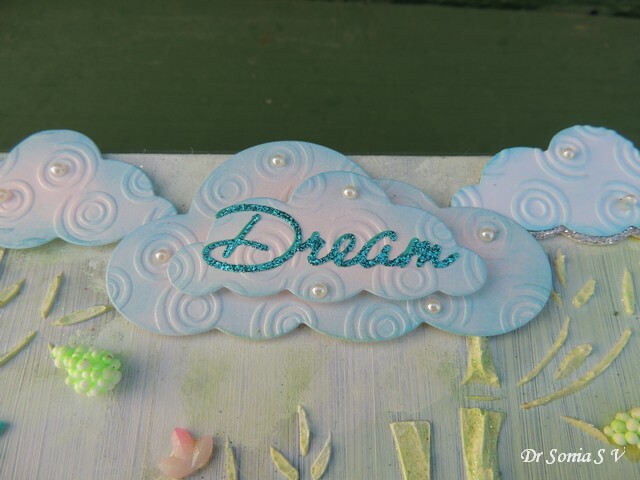 Hehe my background looked rather shabbily inked so resorted to crackle paint to salvage the situation !The blue glitter you see is from a bottle of my daughter's nail art kit ...love the contrast it gives to the crackled surface! 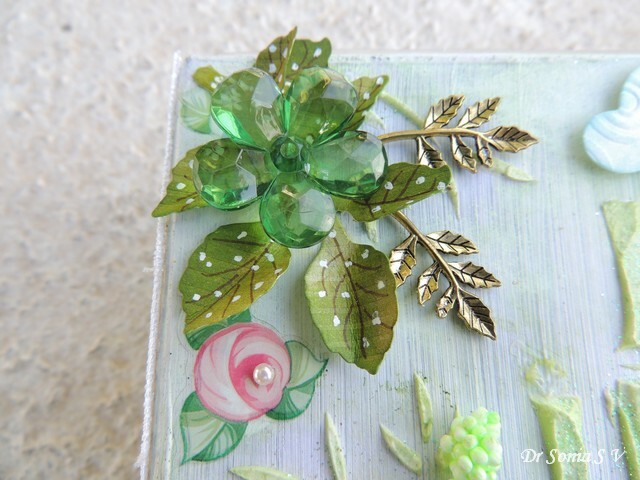 Experimented with a fun texturing media called Glass beads gel using a leafy stencil and painted over it a vibrant green. 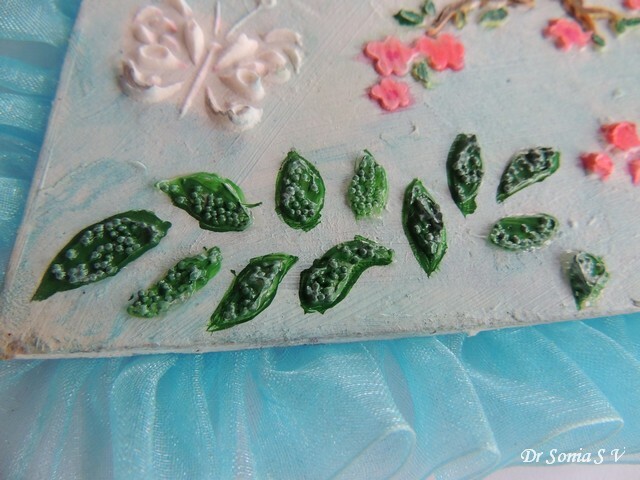 I later felt the green was too garish so camouflaged it with handmade Thai Clay roses and Heartfelt creations die cut leaves. 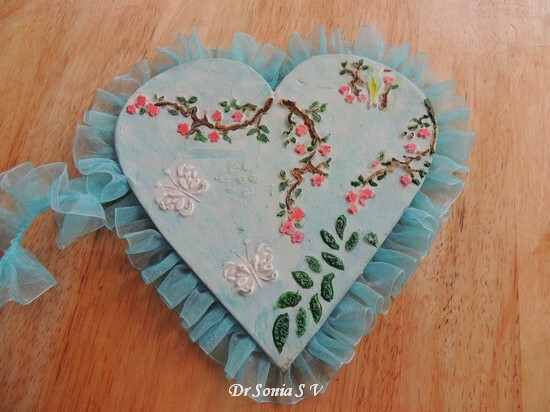 I am still taking baby steps in Mixed media but I do hope you enjoyed this step by step and how my heart plaque finally turned out!